A big round of applause for Rob for posting some awesome recipes over the past week! No worries about food, because I was still cooking up a storm. 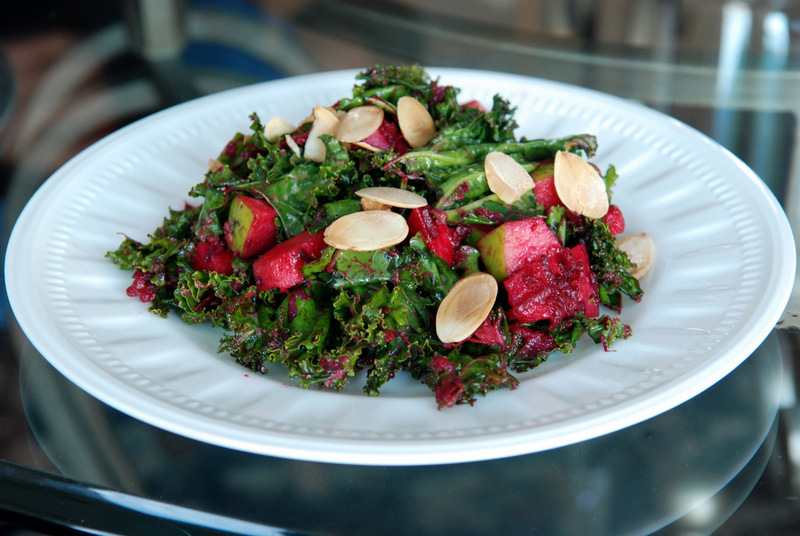 In fact, I feel almost guilty about taking so long to tell you about this lovely kale salad. I have shared the recipe countless times since I made it, but have yet to blog about it. Trust me, it is fabulous. This is a kale salad. 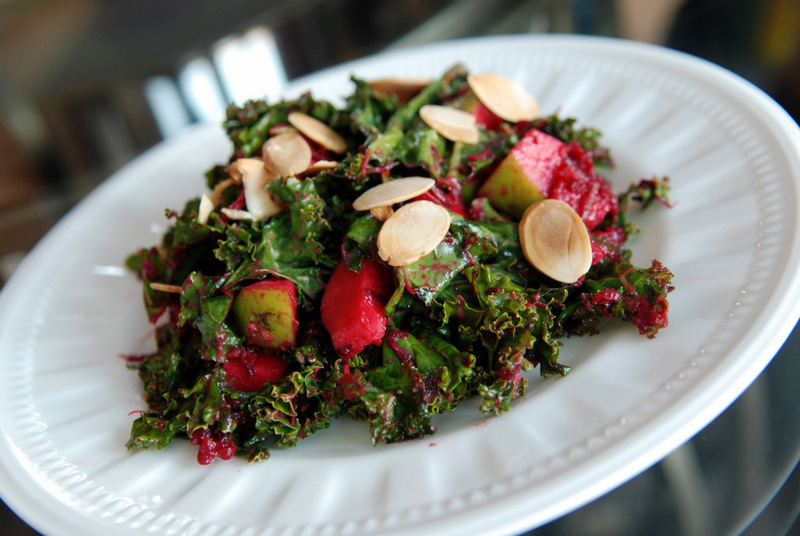 A salad made with raw kale. I know you are raising your eyebrow, thinking that kale is so bitter and tough, why would you eat it raw? Well, it is more of a wilted kale salad because you massage it into silky oblivion, kneading in the flavours. I was (loosely) inspired by the raw kale salad in Lucid Food, and kept it as a creamy salad with the addition of avocado. It is combined with a splash of olive oil and garlic for a luscious dressing. I chose to top the salad with a tart Granny Smith apple as well with grated raw beet (yes, you can eat it raw) instead of carrot which made the apple turn a brilliant shade of magenta. Toasted almonds add another layer of nutty crunch. A perfect salad for potlucks, and even for leftovers (gasp!) because you actually want this to be a wilted salad. This is my submission to this month’s No Croutons Required featuring creamy soups and salads. 1. Place kale in a large bowl with the avocado. Add salt, garlic, and olive oil. Mix very well, “massaging” the greens for about 3 minutes. The kale will turn darker, become more pliable and shrink. 2. Add beet and apple to massaged kale. Toss gently. Taste and season with additional sea salt, if necessary. Sprinkle with toasted almonds. I made this and it is absolutely delish! I’ve heard such good things about massaged kale salads but still haven’t gotten around to giving it a go. WIth all of these fab mix-ins, I’m sure it must have tasted amazing! Salad looks soo catchy,fresh and interesting.. AWESOME recipe. I’m supposed to be getting kale with my csa today and will buy beets at my natural food store. Definitely making this one! Massaging the kale with avocado = I totally need to give raw kale salad another chance! i love massaged kale salads. i could eat one every night for the rest of my life! yours looks super yummy! This salad looks delicious! All of those flavors and textures must taste amazing. Yummm nice to see the photos that go along with the recipe you sent me a while ago!! I haven’t bought kale in way too long, but I really want to try out a raw salad like this so I should. Rob’s contributions were excellent. 🙂 I loved that he added avocado to vegan overnight oats! !